Late 18th and early 19th-century enclosure of former common and inn along early 19th-century turnpike on northern edge of moor. The area falls within the 19th-century tithe parishes of Henllan and Nantglyn. Little recent archaeological fieldwork has been undertaken within the area. The character area occupies an area of about 2.5km2 of improved grassland towards the northern edge of Mynydd Hiraethog, between a height of about 340-500m above Ordnance Datum. It includes the summit of Gorsedd Bran and faces predominantly to the north and east. The area is drained by a number of northward flowing streams which drain into the Afon Uchaf and Nant y Lladron, tributaries of the Elwy river system. 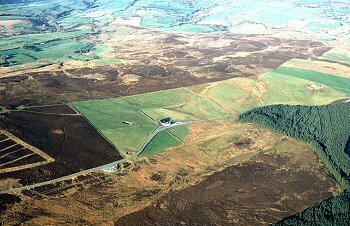 Early activity in the area is represented by a series of Bronze Age burial mounds forming part of a small but distinctive barrow cemetery on Gorsedd Bran, adjacent to the modern forestry plantation on the eastern side of the area. The barrows are visible from the lower ground towards Bylchau, to the north, and seem likely to have been constructed by particular prehistoric communities which exploited both lowland and upland resources in this area. Settlement is limited to a probably early 19th-century dwelling Tan-bryn-trillyn which had become renamed as the Sportsman's Arms public house by the 1870s which, at a height of about 455m above OD, styles itself as 'The Highest Inn in Wales'. The stone dwelling, now rendered, with an early 19th-century cartshed at the rear, is set at the middle of a distinctive rectangular series of banked fields set out symetrically between the early 19th-century Pentrefoelas to Denbigh turnpike road and Henllan-Llansannan parish boundary (the modern road has been diverted to run close to the public house), and was possibly specifically set up as a coaching inn with grazing in the early 19th century to serve travellers, tourists and sportsmen, which became associated with the now ruinous 20th-century hunting lodge of Gwylfa Hiraethog, set in moorland just to the west. Other field boundaries and roadside boundaries in the area are largely of post-and-wire. Several small roadside quarries belong to the period of construction of the turnpike road.